Edible Arrangements offers you the chance to own your own business in the fast growing fresh fruit, specialty foods and gift-giving industries. History The Edible Arrangements® concept was launched in East Haven, CT in 1999. The company began franchising in 2001 in Massachusetts with additional stores quickly following in Connecticut, Georgia and New Jersey. Edible Arrangements® is currently growing internationally, with stores throughout United States, Canada, Puerto Rico, United Kingdom and U.A.E. In 2006 Edible Arrangements® launched Frutation®, a new concept that will take fresh fruit products to the next level. Frutation® is an all natural fruit station with a product collection that targets consumers who want a fresh and delicious treat on the go. The menu includes a variety of items such as Fruithy (smoothies), fresh juices, fruit salads, spiced fruit salads, fruit sundaes and dipped fruit. The concept provides a unique and healthy option and is built upon the reputation of Edible Arrangements® which is known for product quality, novelty and excellent service. & Services Edible Arrangements® specializes in creating delicious fruit designs filled with fresh strawberries, pineapple, grapes, oranges, cantaloupe, honeydew, bananas and pears. Arrangements are guaranteed fresh and are available in a variety of styles and sizes. They are perfect for any occasion from happy birthday, thank you, congratulations and sympathy to business events, client gifts and employee appreciation. Each arrangement is made to order and can be customized with a jar of all natural fudge and a special occasion mylar balloon. All ingredients are natural, no preservatives or sweeteners are used. Detail Franchises available in most states in the US and internationally in many countries. Edible Arrangements currently has over 800 locations throughout the United States, Canada, Puerto Rico and United Kingdom. 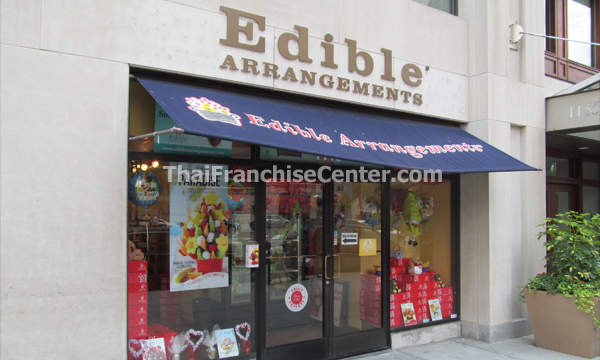 Edible Arrangements is also moving forward with international plans in selected countries around the world. Franchisees will receive comprehensive training and business and development consulting. Our business is backed by years of industry experience, and our custom designed business system features state-of-the-art technology to assist you in operating and marketing your business. We are currently seeking franchise partners interested in operating under an Area Developer / Master License agreement to introduce and develop the Edible Arrangements concept throughout territories around the world. Investment range may vary depending on the number of units to be developed and the area of development. A minimum net worth of at least $300,000 is required and specific financial requirements will be provided upon review of your application. Our in-depth review process will start with you completing our International Franchise Application. Our real estate department will provide guidelines and assist you in selecting an appropriate location for your Edible Arrangements store. You will receive periodic visits from your franchise representative, who will provide guidance on quality control, operational compliance, marketing and more. In addition, our support team is always only a phone call away and can answer any questions that arise during the day-to-day operation of your business. Our proprietary point of sale system is the critical backbone of each Edible Arrangements® store, with 24/7 access to our industry leading on-line franchise support system. This support site is specifically designed to assist in the operation of your Edible Arrangements® business. It contains our confidential Operations Manual, marketing materials and guidelines, company news, online ordering from preferred vendors, forms and guides, online communication with our support team and more. Building recognition of the Edible Arrangements® name is an important part of the Edible Arrangements® business. You will have access to professional consumer marketing and advertising materials, as well as guidelines on how to develop and implement a successful marketing campaign. And remember, your unique, one-of-a-kind product creations are your greatest marketing tool. Edible Arrangements® state of the art technology is designed in tandem with Netsolace, Inc. who provides all software support, web development and e-commerce management for Edible Arrangements® stores. etc. Join the business that is taking creativity to a delicious new place. Edible Arrangements franchisees are creating a unique emerging product that customers love. After just one taste they become lifelong enthusiasts. And with so many bouquets to choose from, they can’t help coming back for more. Contact Edible Arrangements® International, Inc.